In the shadow of the brilliant 2010 Film Festival doco, Inside Job, the last thing the right wing will want is another movie that reminds the general population that free market deregulation low tax Milton Friedman dogma is as beneficial as lung cancer and caused the current economic meltdown and crises of capitalism. 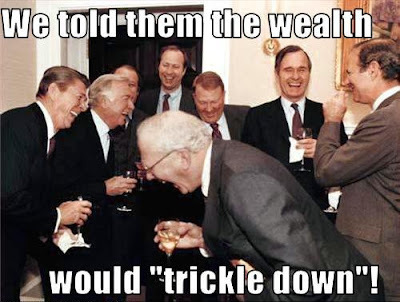 Wealth does trickle down. Poverty trickles up.